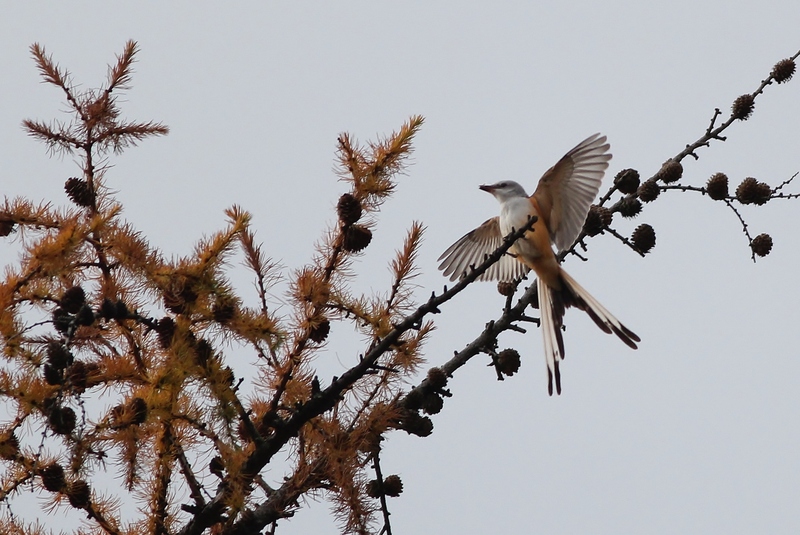 Scissor-tailed Flycatcher and Lark Sparrow! 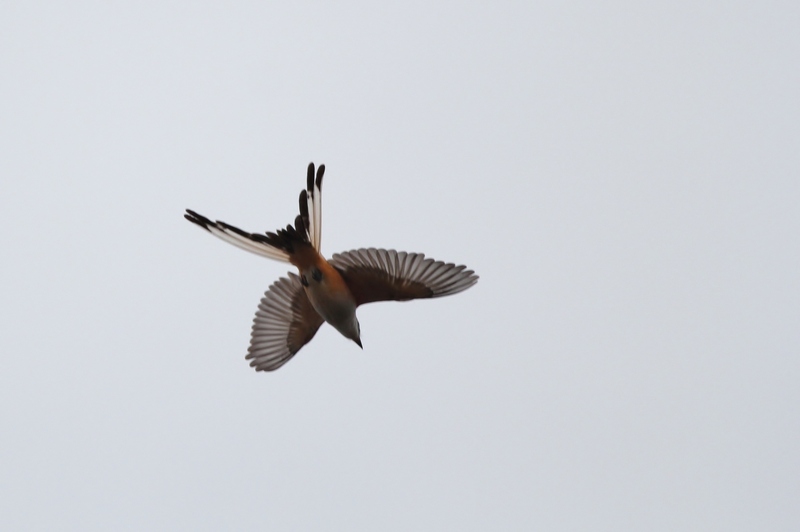 Coming back into Lewes this past Saturday, after a day-long Paulagic trip, I switched my phone off of airplane mode and was immediately inundated with loads of RBA text messages and voicemails that I had missed during our time out on the ocean….David Allen had found an adult Scissor-tailed Flycatcher in Philadelphia and Alan Kneidel found a Lark Sparrow at Cape Henlopen! I was already planning to stay near Lewes that evening so Tim Shreckengost, Michael David, Alan Kneidel and I decided to search for the Lark Sparrow first thing Sunday morning and then if we heard an update about the flycatcher, Michael and I would leave Delaware and head north to try to see the bird on our way home. If the flycatcher wasn’t re-found, we would just keep birding Sussex County, Delaware with Tim and Alan….either way, it was bound to be a fun day of fall birding. 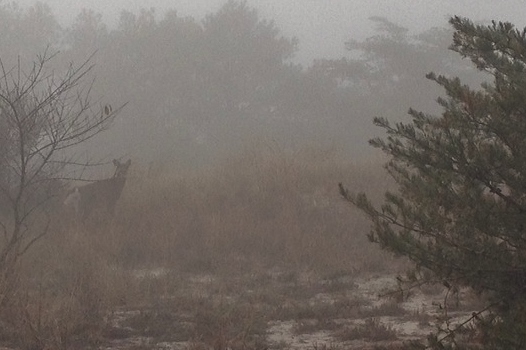 On Sunday morning, we woke up to thick fog shrouding coastal Delaware. Tim drove us over to Cape Henlopen State Park after a quick stop at Wawa for energy drinks and breakfast sandwiches. We pulled around and parked in the basketball court lot and spread out to search for the Lark Sparrow. Alan said it was mixed with a pretty big group of juncos and Chipping Sparrows. There didn’t seem to be too much activity at first, but distant chips from Yellow-rumped Warblers and the occasional calls of Song Sparrows and Field Sparrows kept our hopes up. I got a quick glimpse of a Great Horned Owl fly out of a tree. 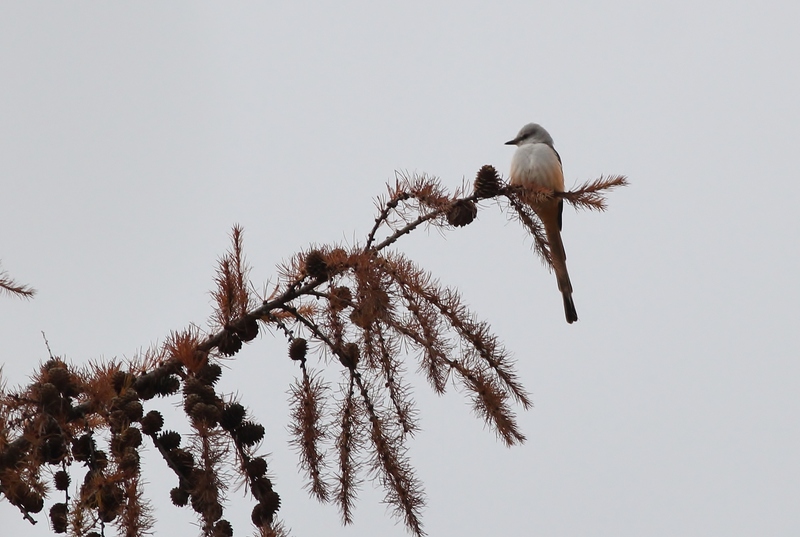 Brown-headed Nuthatches were squeaking from pines off in the fog somewhere. An immature Cooper’s Hawk glided silently through the fog, briefly landing in the top of a nearby snag before darting off. After about an hour, the four of us joined back up near the car. 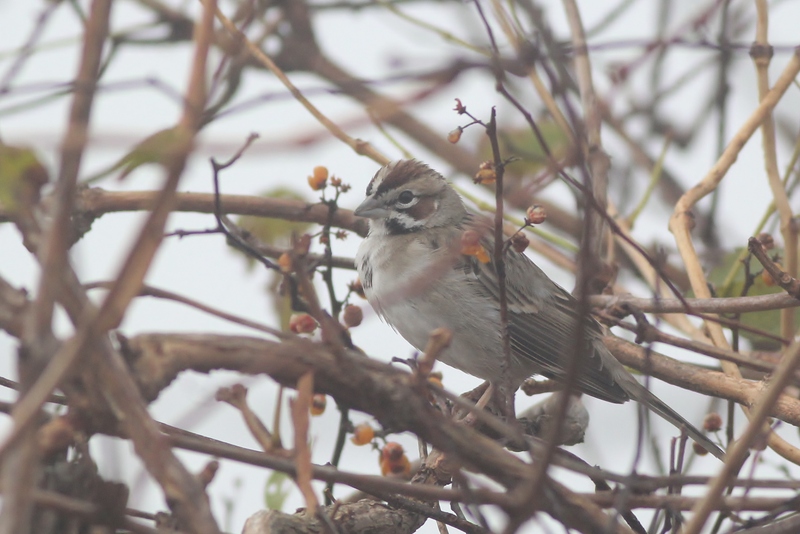 As we discussed what we had each independently come across, a flock of kinglets, chickadees, and a few White-throated Sparrows started making their way towards us. Then came some Northern Cardinals and 3 Brown Creepers. One Savannah Sparrow and a few Chipping Sparrows were mixed in with multiple Song and Field Sparrows. A few minutes later, I heard a whistle from Alan and turned to see him pointing to a tangle of vines out in front of us. 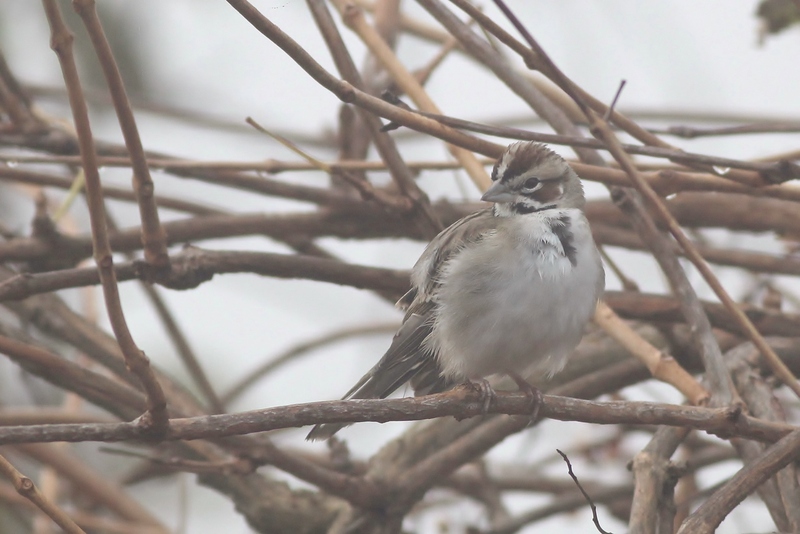 Tucked into the vines and preening was the Lark Sparrow! 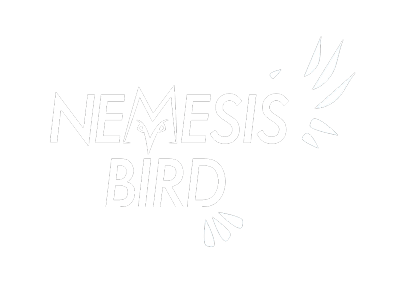 If it wasn’t for the bird’s striking head pattern, it would have almost blended in with the vines and dead leaves perfectly. After a minute or two, the bird hopped up onto an exposed branch and I was able to get a few unobstructed photos of the western visitor. Excited with our success, we left the Lark Sparrow and went over to Fort Miles to see what passerines were hanging out in the dune scrub. Three Red-breasted Nuthatches gave us the east coast nuthatch sweep, and a ‘Yellow’ Palm Warbler, Pine Warbler, many Yellow-rumped Warblers, and good numbers of sparrows helped round out a nice list for the state park for the morning. 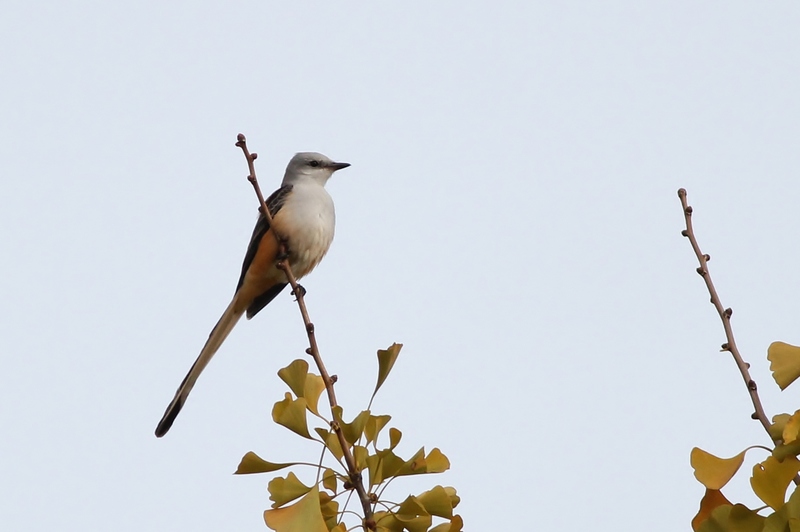 About that time we also finally got an update on the Scissor-tailed Flycatcher. It was being seen off-and-on for the past two and a half hours. Michael David and I parted ways with Alan and Tim, and drove up towards Philly. By 1:45pm, we made it to Bartram’s Garden in Philadelphia, the former property of famous botanist John Bartram and current hang-out of a Scissor-tailed Flycatcher. Within a few minutes of searching, along with a few other birders, we found the flycatcher slowly working a hedgerow and actively capturing insects. For well over an hour, birders were scattered around the gardens watching the flycatcher sally from tree to tree, capturing large insects on every attempt we were able to witness. Clouds had moved in, which made for tough lighting conditions but the bird was cooperative enough that we were offered many different photo opportunities. This was a really special bird and one I hope a lot of birders in the region take the time to visit while it is still hanging out at Bartram’s. 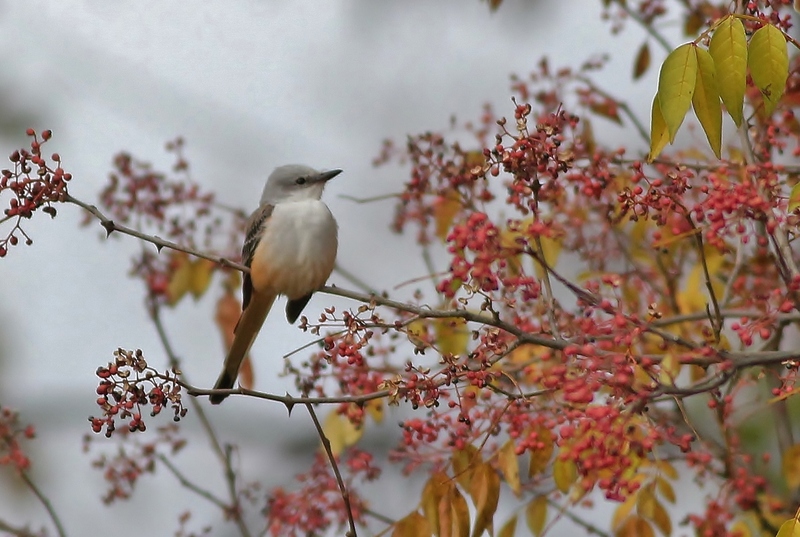 Thanks to the local birders for getting the word out so quickly and sending out updates. 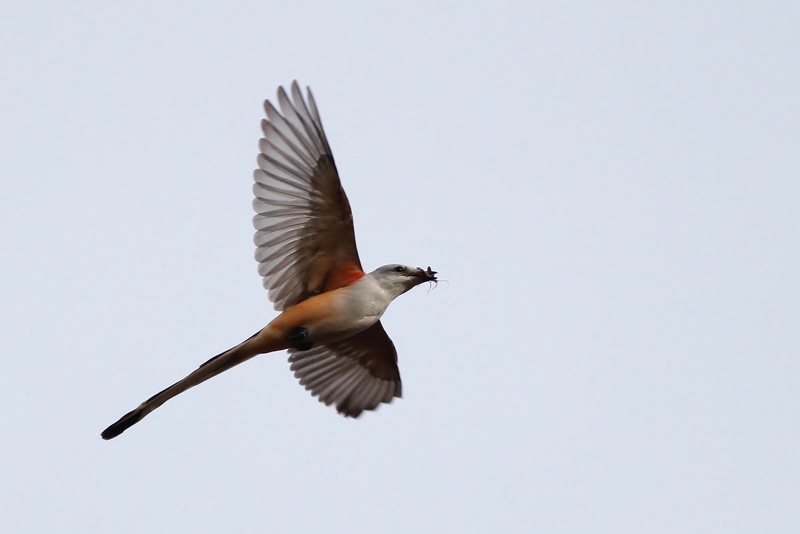 What a special treat and beautiful bird!